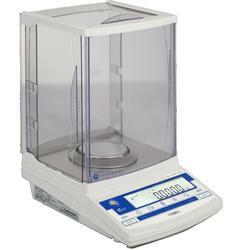 The ViBRA HT Series Analytical laboratory balances from Intell-Lab are produced in Japan in one of the cleanest facilities you will ever see. The quality of workmanship and attention to detail is superb. Starting at the bottom of the balance, there are three support points, two of which are adjustable to provide leveling. The base contains the revolutionary Vibra double ended tuning fork sensor, which gives almost instant start up because it does not require a warm up time, unlike conventional force restoration balances. Probably the most stable system on the market, the Vibra module is also very resilient against shipping or any movement induced damage. As there is no coil, it is also stable when weighing magnets. The floor of the weighing chamber is lined with high quality stainless steel and is fitted with a spill ring (to guard the internal components from accidental spillage), an anti-buoyancy plate to ensure air currents within the chamber do not affect the weighing results and a 3.15” diameter platter. There is plenty of room for large, awkward samples to be weighed in the 6 x 6.25 x 9.5” chamber. The weighing chamber of anti-electrostatic material is easily removable to enable proper cleaning of spills and contamination, as regular cleaning is recommended. The three doors give excellent access for operations such as pipette calibration.